Chiang Mai (literally, "New City") was the capital of the independent northern kingdom of Lanna (founded 1296) until it was conquered by Burma in 1558. For the next 200 years it passed back and forth between Burma and Thailand, until the Burmese were finally driven out in 1774. After that, Chiang Mai became part of the Thai kingdom. 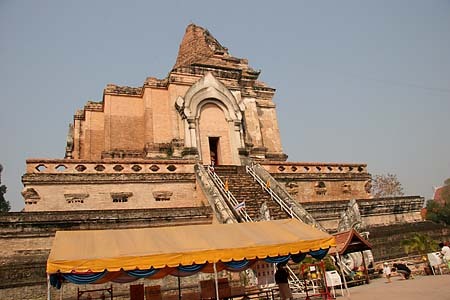 Wat Chedi Luang was started in 1391 by King Saen Muang Ma, rising to about 85m (282 feet) tall. An earthquake in 1545 knocked down the structure to its current height of 42m (140 ft) as seen today. The temple housed the Emerald Buddha from A.D. 1468-1553.